The sharp sell-off in the fourth quarter, part of which has been recovered in January, serves as a timely reminder of how quickly sentiment can shift. In these environments, technicals (supply/demand), rather than fundamentals, tend to drive prices. These periods may create opportunities for managers with the expertise and liquidity to take advantage of investments arising from the volatility. 1 Senior secured loans are represented by the Credit Suisse Leveraged Loan Index. High yield bonds are represented by the ICE BofAML U.S. High Yield Index. 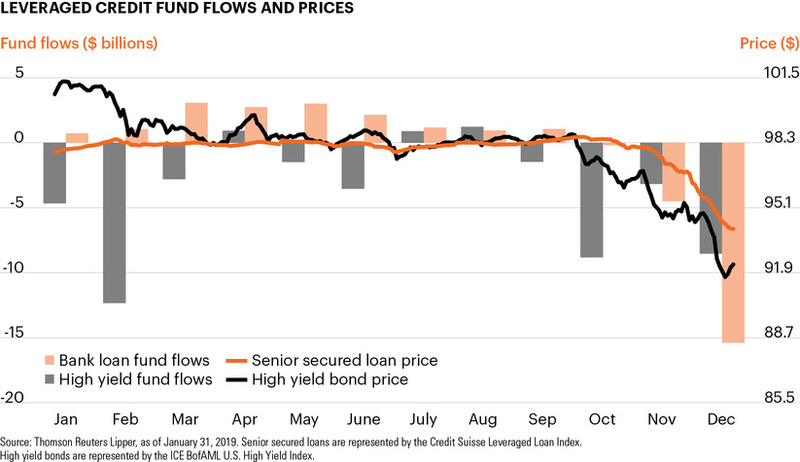 2 JPM High-Yield and Leveraged Loan Morning Intelligence, December 21, 2018, based on fund flow data from Thomson Reuters Lipper. 3 Default rates are based on data from S&P Global Market Intelligence.